What is the password generator? The complexity of passwords is generally determined by their randomness. In order to be able to rely 100% on the fact that the passwords are randomly generated, an algorithm for generating passwords is indispensable. The password generator performs this function and is completely integrated into the software. Main menu/Extras/Password generator: Here, the password generator is accessed directly. Passwords generated in the password generator can be copied to the clipboard. When creating new records: Once the password field has been selected in the reading pane, the password generator can then be directly opened in the “Form field” tab via the ribbon. Passwords generated here can be directly entered into the password field for the new record using the “Adopt” button. Alternatively: The password generator can also be accessed on the right in the password field in the reading pane. The Character section is used to define the character groups that should form part of the password. 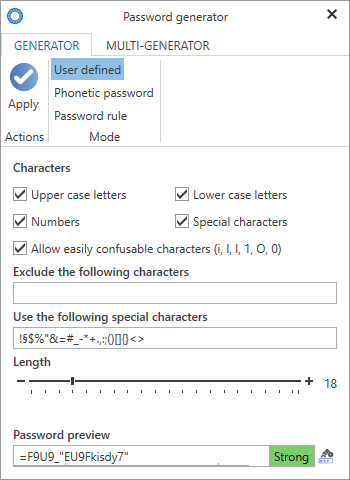 This section can also be used to exclude (special) characters. 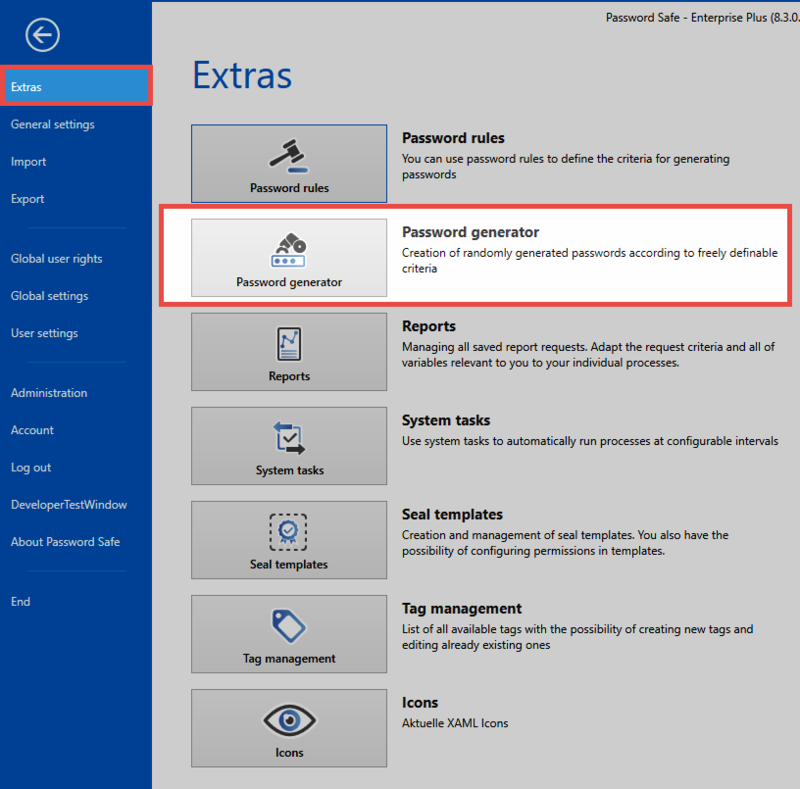 Once the password length has been defined, a preview of a password that corresponds to the configured criteria is displayed on the bottom edge of the password generator. The “shuffle function” can be activated via the icon on the right next to the password preview. This will generate a new password in accordance with the defined criteria. This type of password can be recognised by the fact that it is relatively easy to remember (they are “readable”) but do not have any association to terms found in dictionaries. Only the number of syllables and the total length are defined in this case. 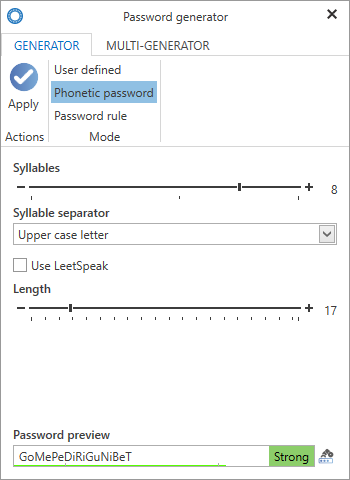 Options that can be set are how the syllables are separated and whether to use LeetSpeak. The generated passwords are saved in a text file in the local user directory and can be opened immediately if desired.